Karpathos is ideal for relaxing. So much sun, sea and relaxation. Forget local, nightlife and historical-artistic testimonies. What Scarpanto offers the visitor, is represented by wonderful beaches, crystal clear sea, small inlets and lots and lots of relaxation. The ideal way to fully enjoy the island is a week. After spending entire nights (!!) thinking about how to set the island's guide, we came to the conclusion that the best way was to indicate the beaches of the island, proceeding in a sort of hypothetical division among the most renowned (on paper) and those more isolated, sometimes wild, and, therefore, absolutely marvelous. That said, a premise is a must: NO BEAUTIFUL BEACHES EXIST! Every place, cala, inlet has its beauty, and the evaluation is purely subjective; there are many factors that lead people to judge: emotional, climate, sensations ... .. So, take these descriptions as purely subjective of those who wrote the guide, because there is nothing better than looking and judging with their own eyes. Halfway between Kira Panagia e Pigadia, a spartan beach, wild less crowded than the rest of the island, with big pebbles. Crystalline sea. The beach is located on the eastern side. To reach it, you must follow the signs for Aperi; Once you have passed the village, you go down a rather winding panoramic road towards the beach. You can stop at the taverna near the beach: low prices, good quality. Parasols and sunbeds are available, as well as ample parking. The cove is located below the mountain, behind which, in the late afternoon, you can admire the beautiful colors of the sun that disappears. North of Pigadia, close Spoa, is located this beautiful beach, accessible on a downhill road in the direction of Agios Nikolaus (not to be confused with the homonymous beach of Arkasa); before reaching Ag. Nikolaus, a dirt road on the right, poorly indicated, leads to the small beach of Sfaka and, subsequently, to Agios Ioannis, a little corner of paradise with sandy and pebble beach, beautiful sea with vivid colors. For lunch, not far, stop at the Taverna "Ta Votsalo": Excellent cuisine, affordable prices and evocative panorama location. Very beautiful, in a truly impressive bay that has nothing to envy to the more noble. Located south-west of the island, at the southern tip, you get there by descending the road from the village of Arkasa, until the end of the same where you will find the beautiful church of Agios Theodoros and the homonymous Taverna (highly recommended: excellent prices, excellent typical cuisine and wonderful location). The beach is very beautiful, dug into a clay pit that flows naturally, allowing also to make pleasant regenerative sludge for the skin in the small limb present in the area. The water is really cold. One of the few beaches with fine sand. The sea, as always, is enchanting, crystalline, with the bottom gradually descending. Ideal beach for children. Particularly equipped: the prices for umbrellas and sunbeds, slightly more expensive than the other areas, start at € 7. In the area, you will find taverns, restaurants, accommodation and supermarkets. The bay (photo above) is very beautiful, panoramic, and sheltered from the wind; you will find several beaches, within a few hundred meters, all equipped. If you do not particularly like the golden sand of this beach, do not give up, because shortly after you will find another, smaller, pebble beach! If looking at the photo above, you should have a sense of deja-vu, do not worry; you will probably have seen this picture on some brochures, or some travel agency. Apella It is one of the most famous beaches in the area, a true must of the island. An enchanting, wonderful place, surrounded by high cliffs, dense vegetation that is one with the beautiful beach of white pebbles, and a sea with beautiful reflections. The most beautiful of the island, absolutely unique and unmissable. It is located north-east of the capital; it can be reached by sea with small boats or through a winding dirt road that goes down to the sea. Arrive early in the morning in August: it is the most beautiful beach, known and, of course, crowded with the Island. Pay attention, because there are not many road signs. For many it is considered the beach for the summer Karpathos. Located not far from the most famous Amoopi, this wonderful and quiet beach, is unfairly and incredibly uncrowded. Choose it not only for peace, but above all because it is really beautiful! Passing Amoopi, you can reach it by following the signs, that during the route there is no shortage: the beach is located near the Poseidon Hotel. Sandy beach towards the shore and more pebbly inside, with a beautiful crystal clear sea, with colors ranging from turquoise to blue. Sun loungers and umbrellas available. On the left, along the same coast, there are the most secluded, but equally beautiful, Argilos Beach e Lafrans Beach. Heaven lives here! 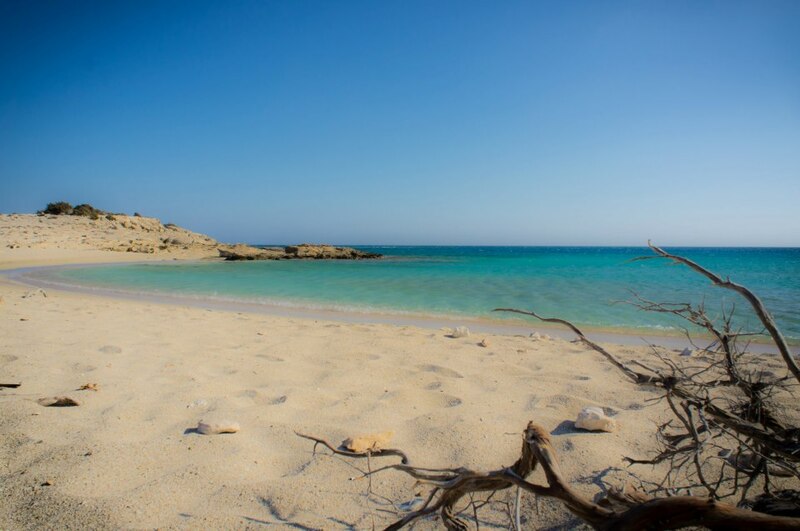 For those lucky enough to stay in Karpathos, Diakoftis It is one of the best beaches on the island, an authentic show. Located south of the island; to get there just follow the signs to the airport, and after a while you get to Diakoftis. A rather small beach of white sand and the Caribbean sea. It is really beautiful, but given the size, rather crowded in the highlight weeks of August, so it is recommended to arrive early in the morning. Available on the spot, umbrellas and deckchairs (not many), and a small parking nearby. The area is usually rather windy. Top beach of the Summer Karpathos. Perhaps the most beautiful of the island, even for the very low number of bathers. To get there, you have to take the path that is on the side of the Eklissia Kira Panagia, the red dome church. About 30 minutes of walking, through the path that offers glimpses and wonderful views. At the end of the walk, you will find the quiet and lonely beach of Kato Lakos. The route to get there is quite challenging, but the beauty of the beach completely repays the efforts. Do not forget, of course, the sneakers. You will find two beaches: one of pebbles and the other of white sand. The sea is crystal clear, with a backdrop that varies from large pebbles to small rocks that emerge; the coves more aloof, are thrown by the nudists. Another beautiful beach, not far from Apella, but, at the same time, absolutely magnificent. A beach of clear pebbles, crystalline waters and vivid colors. As for the other beaches, the descent is not the easiest; from the top of the mountain you proceed through a steep and winding dirt road until you reach the beautiful EKLISSIA, or the red dome church, which dominates the small village and the underlying inlet. With respect to Apella, there are also two tavernas, a few bars and studios along the entire descent. Umbrella sunbeds available at a cost of about € 6: there are not many. In August it is advisable to arrive early in the morning because it is easy to find it crowded. More than a beach, it is a bay consisting of three coves, which differ in position and formation. A sandy beach sheltered from the wind, above all, particularly suitable for families; a pebble beach, and finally, a third beach, rather large, of sand and pebbles particularly exposed to the winds. It is probably the wildest bay in the island; As well as being particularly well-equipped, you will find taverns, bars and supermarkets nearby. It is however a beautiful inlet, whose beauty can be found already during the descent from the homonymous village, up to Kato Lefkos. Crystal clear water and calm sea, when there is no wind; waves that entertain young and old, during particularly windy days. Also for Lefkos, it is advisable to arrive early in the morning, especially if you had to opt for the sandy beach. We dedicated a special article to this fantastic village, of which we absolutely recommend the visit you can access directly through this link. As for the beaches, in the area they are worth a visit Vananda e Papa Mina. Of course, it is worth getting here, especially if you are interested in visiting Olympos, really beautiful and picturesque; otherwise, in the central-southern part of Karpathos, as far as beaches and the sea are concerned, you are spoiled for choice. VanandaFirst of all, it is a beautiful beach with small, flat pebbles, transparent water, surrounded by pine trees. Not far from the Port of DiafaniYou can access the main road from Olympos to the port, taking a dirt road that leads to here. To reach the beautiful and peaceful Papa Mina, just follow the signs to Forokli, and continue after a junction for the dirt road that leads to the beach. Wonderful inlet, not very popular, despite being in the most popular tourist side of the island: the south-east. 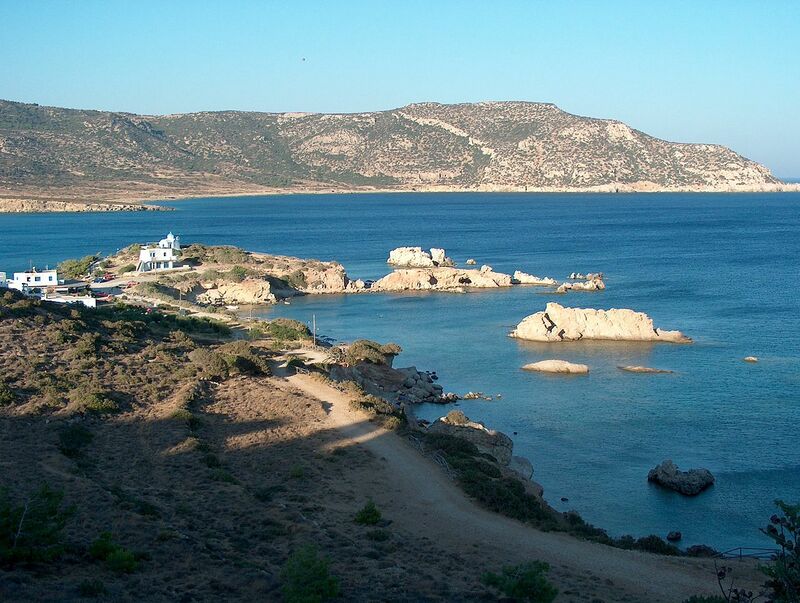 The Beach of Psoraris it is located about twenty kilometers south of Pigadia, not far from the airport. It can be reached by following the signs for Diakoftis; before arriving, you will find a small billboard that shows you the dirt road to take to get to this wild, pristine beach. The coastline is long and of golden sand with reflections tending to mahogany. Wonderful water, with colors that go from turquoise to blue to green. You will not find anything at all, so, equip yourself by bringing the necessary with you. Being isolated, it is popular with naturists. Those who love relaxation, peace and, above all, the sea, the suggestive beaches, the coves and the inlets that they can thrill, will not remain indifferent to the beauty of this island; we are sure of it. How, moreover, we are sure that those who have chosen to spend the Summer Karpathos, will keep forever the memory of this island and the desire to return. I say ...... for personal experience ! !